Drug acetylating transferases (aac) are enzymes that inactivate aminoglycoside antibiotics by acetylating its O- and N- atom in the drug. aac genes were detected in bacterial plasmids and integrons of many pathogenic bacteria rendering drug resistance. The unique CAT enzyme was discovered early that could acetylate chloramphenicol at 1’ and 3’ –OH group and largely used as reporter gene in expression vectors. Aminoglycoside 6’-N-acetylating enzymes were mainly classified as acc6’-Ia to aac6’-If and genes were designated as aacA1 to aacA8 but aacA16 or aacA41 types isomers were also sequenced. The isomers aacA3, aacA4 and aacA8 are very identical contrary to other aacA1 isomers. Aminoglycosides 3’-acetylating enzymes were designated as aac3’-Ia to aac3’-Xa and genes were designated as aacC1 to aacC10. Sequence analysis suggested that aac2’, aac4’ and bifunctional enzymes (aac6’-aph2’’) were different class of acetylating enzymes. But aac6’-1b-cr protein that was involved in ciprofloxacin resistance resembled to aac6’-1b with point mutations. Interestingly, cat gene has no similarity to aacA1 or aacC1 genes and so far was ignored as being non-clinical origin. But now catB3 gene was reported in many MDR plasmids of pathogens like Shigella flexneri (pR100), Yersinia pestis (pIP1202), Escherichia coli (pNR1), Pseudomonas aeruginosa (pOZ176), Klebsiella pneumoniae (pNDM-MAR) and Salmonella enterica (pHXY0908). Such plasmids were also frequently associated with acc3’ and aac6’ enzymes including diverged ß-lactamase genes (blaTEM, blaNDM, blaCTX-M etc) and drugs efflux genes (acrAB, mexAB/ CD/XY, tetA/S) as well as AG adenyl transferases (aad) and AG phospho transferases (aph) genes. Surely, appearance of cat, amp, tet genes in conjugative plasmids of superbugs is frightening as those genes are randomly used in expression vectors for RDT work. Diversities among drug acetylating enzymes were found very high suggesting multiple mechanisms of their origin. The MDR is a unique phenomenon where bacteria acquire MDR genes in plasmids and chromosomes and can survive in stressful environment containing high concentration of antibiotics and other pollutants . Such bacterial infections, on the other hand are hard to cure by antibiotics contributing huge life and wealth loss worldwide . Aminoglycoside acetyl transferases modify the drug’s structure by acetylating its N-atom or O-atom in the drug and as a result such acyl-drug could not bind the target site to inhibit bacterial replication, transcription or translation [3-8]. So patient could not get rid of bacterial infections by simply taking few tablets of ampicillin, streptomycin or gentamycin antibiotics because acetyl transferases were activated in plasmids that inactivate drugs. The AMR mechanisms broadly classified into six major categories: (1) activation of β-lactamase (bla) (2) activation of drug modifying enzymes (aac, aad, aph) (3) activation of drug efflux genes (acr, tet, cmr, mex) including ABC drug transporter (4) alteration of target sites by mutations (rRNA, PBPs) (5) neutralizing antibiotic after binding with drug like tetM and (6) lower expression of porins restricting drug entry like imipenem. Thus it is very complex to stop gene creation in nature under stressful environment and none could even imagine such changes how created an acute problem in medicine today . The first acetylating enzyme was discovered as cat gene or chloramphenicol acetyl transferase. Chloramphenicol was first discovered in actinomycete isolated from soil by Ehrlich in 1947 followed by Tamura in 1971 from Streptosporagium viridogriseum. Chloramphenicol inhibits the bacterial 30S ribosome and is a very good antibiotic as it cures the common diseases caused by S. aureus, E. coli, K. pneumoniae, and more. However, soon cat gene was discovered in many bacterial pathogens those were found resistant to chloramphenicol . Cat enzyme is different from “amp” or “tet” gene’s mode of actions in that it acetylates the chloramphenicol drug (1’ and 3’ positions) in such a way that acetylated drug no longer able to bind the bacterial ribosome. Thus cat gene containing bacteria (in plasmid) easily grow containing MIC amount of chloramphenicol in vitro as well as in vivo in patient blood [11,12]. Sequence analysis suggested that cat gene was a different enzyme in amino acid sequence than aacA1or aacC1 and other isomers. Why cat gene was not considered as aac enzyme was not sure to say but aacA1 enzymes are linked to clinical origin found in MDR plasmids with other MDR genes like blaTEM, strA/B, sul1/2, tetA/S type genes including Tnp and Tra genes [13-15]. So cat gene (designated as catB3 and was very famous for CAT in vitro transcription technology) was isolated from small R-plasmids in bacteria that were not clinically relevant . However, it was detected now in many large conjugative plasmids of common pathogenic bacteria . Similarly, aac(6’) enzymes was symbolized as aacA1 to aacA9 but other isomers like aac(3’) designated as aacC1-aacC9 [17-20]. aac2’’ and aac4’ etc were kept aside and their divergence was labelled as aac(2’’)-Ia/b/c or aac(2’)-I/II etc [21-23]. Similarly, there are catB2/4/8 or catA_1/2 isomers in the literature. Mutations of cat gene as well as aacC1 and aacA1 genes were never investigated as compared to huge citations of β-lactamases mutations (blaTEM, blaOXA, blaCTX-M etc) that conferred PDR or XDR type resistance in bacteria . The origin of this review however, lies on the facts that GenBank data analysis of aacA1/C1 genes contradicted highly for consensus primers that to be used to study the contamination of superbugs in Kolkata water bodies, particularly Ganga River water. GenBank data analysis clearly suggested that cat genes were widespread in bacterial plasmids and integrons (Tables 1-4). Class I integron mediated catB3 genes of many bacteria like 2177bp IntI1 integron of Pseudomonas aeguginosa (AN:EF660562); 2731bp Class I integron of Escherichia coli (AN:ABP35557), 5857bp class I integron of Klebsiella oxytoca, 2297bp Class I integron of Acinetobacter baumannii (AN:ADF59078), 1738bp Class I integron of Aeromonas veronii (AN:ALB07153), 4632bp In846 integron of Enterobacter cloacae (AN:AGJ70489) and that of Proteobacteria (AN:WP_000186237) were identical in protein sequence . Interestingly, such integrons were also linked to other type’s aminoglycoside acetyl transferases like aacA1, aacA4 and aacA7 . Aac6’-Ib 201aa M55547 AAA98404 Intl-1/ P.
aacA7 Aac6’ 152aa KJ679405 AID65189 Intl-1/ P.
aac6’-1a 152aa EF577406 ABQ65124 In58/ P.
Table 1: Classification of major AAC(6’) acetyl transferase; The accession numders of plasmids, integrons and genomic fragments carrying aac(6’)-type genes were demonstrated. The different types of pathogenic MDR bacteria and associated mdr genes were also described. Aac3’-Ia 154aa AY577724 AAT51721 3035bp genomic A.
Aac3’ 286aa HQ840942 AES85952 pSRC27-H; 50129bp S.
Aac3’-VIa 274aa nd WP_031611451 nd E.
Table 2: Classification of major AAC(3’) acetyl transferase; The accession numders of plasmids, integrons and genomic fragments carrying aac(3’)-type genes were demonstrated. Protein ids and types of MDR bacteria were also described. Table 3: Localization of cat genes and hybrid aac-aph genes. Popular cat genes in plasmids/integrons of pathogenic MDR bacteria were described with GenBank accession numbers and protein ids. Also activated hybrid aac-aph genes were described including less well known aac2’ and aac4’ type genes that destroy many aminoglycoside antibiotics. Table 4: Characteristics of large MDR conjugative plasmids carrying multiple aac and cat genes. Chloramphenicol acetyl transferases, AG acetyl transferases and other mdr genes were clustered in one plasmid and bacteria carrying such plasmid were usually XDR and PDR types. Further, mutations in gyrAB, 16S rRNA, porB and ABC genes have not been analyzed here. We observed that cat genes were now associated in conjugative plasmids which were hard to rescue in absence in drugs and also could deliver MDR genes into household bacteria. So it seems AMR is a ubiquitous phenomenon in modern days. As for example, in conjugative MDR plasmid (pI1-34TF; 167198bp) of Escherichia coli (AN: LN850163) four acetylating enzymes had been accumulated in four positions of plasmid spreading all across same distance. Two cat genes (cat_1 and cat_2; protein Ids. CRK62767 and CRK62815) were different where cat_2 was catB3 type but cat_1 was related to xenobiotic acetylating enzyme. Moreover two other acetylating enzyme, N-6 hydroxylysine 0-acetyl transferase (protein id. CRK62680; antibiotic_NAT-like) and SPBe2 prophage derived acetyl N-3’-transferase (yokD; protein Id. CRK62756) had roles in inactivating diverse drugs. Such plasmid did contain other mdr genes like blaOXA-1, blaTEM-1, macB (macrolide exporter), MFS, aph (phosphotransferase), aad3’ (streptomycin adenyl transferase), tetA (tetracycline transporter) and tmrB (tunicamycin resistant protein). Further, such plasmid also accumulated HTH-type cmtR and envR, tetR transcription factors in close association with IS-elements and transposons. Multi-align and seq-2 sequence analysis were presented in Figures 1 and 2 where catB3 was found similar but catB8 had many mutations and frequent carboxy-terminal deletions and substitutions . Figure 1: Acetylation of choramphenicol by CATB2 plasmid transfection of HeLA cells with Lypofectamine reagent (panel, A). Lane, 1 free chloramphenicol, lane 2, cell extract with no plasmid, lane 3, 5 μl cell extract and lane 4, 10 μl cell extract with transfected plasmid. Structures of 3-acetylated chloramphenicol (panel-B), N-acetylated ciprofloxacin (panel, C) and tabromycin (panel, D). Figure 2: Homologies among CAT Enzymes: (A) CatB3, catB4 & CatB8 similarities. (B) catA2 and CatA4 similarity and (C) catB3 vs. catA_1 similarity. catB3 gene was present in many MDR plasmids including 249kb Samonella enterica plasmid pHXY0908 (AN:KM877269) and in high molecular weight P1 plasmid of Klebsiella pneumoniae containing mphA (macrolide 2” phosphotransferase; protein Id. WP_000219391), aadA2 (ANT3”-1a), aph3’-1a (protein Id. WP_000018329), GCN5 acetyl transferase (protein Id. WP_003026803) and phosphonothricin acetyl transferase (protein Id. WP_004152096) including other mdr genes like drug transporter tetA/tetG, ABC transporter (protein Id. WP_004118832), MFS-type drug efflux proteins (protein Ids. WP_003846917 and WP_000214125) as well as CTX-M-24/KPC-2/VEB-3 types β-Lactamases. Similarly pOZ176 large plasmid (AN:KC543497) contains catB8a, neo (aminoglycoside 3’-O-phosphotransferas; protein Id. AGL46257) and aac6’-IId (aacA4-type) giving resistance to chloramphenicol, neomycin and amikacin respectively [16,24]. Aminoglycoside 6’-N-acetyl transferase actively acetylates 6-N atom of amikacin, kanamycin, and neomycin [25-30]. BLAST analysis suggested that aacA1 was unique enzyme and had no similarity to aacA2/3/4/5/6 but aacA3 has similarity to aacA4 and aacA8 lineages (Figure 3 and Table 1). Two types (184aa and 172aa) of aacA4 enzyme contained difference in NH2 terminal 13 amino acids indicating a precursor. Aminoglycoside 6’-N-acetyl transferases (aacA1) were located in plasmids and integrons of E. coli and other Enterobacteriaceae and were identical sequence [31-36]. As for example, plasmid NR79 (8298bp) of E. coli had aacA1 including aadA3, catB2, and sul1 genes. Another 8049bp small plasmid pCMXR1 contains blaCMY-9 and sul1 mdr genes with aacA1. However, in Pseudomonas aeruginosa, aacA1 gene was located in class I integron In831 with blaIMP-10 that involved in imipenem resistance. All aacA1 sequences were identical and no mutation was found. Pseudomonas aeruginosa class I integron contains aacA3 gene (protein Id. AIP98294 and AN:KM111260). A conjugative MDR plasmid, pNDM-MAR (267242bp, AN:JN420336) of Klebsiella pneumoniae contains aacA4 gene (protein Id. AFB82784) along with deadly blaNDM-1 and blaCTX-M-15 genes (Table 4) . Another aacA4 gene (AN:ABP35556) was located in 2731bp class I integron (AN: EF488369) of E. coli with closely linked to catB3 gene . Two aacA4 genes (accession nos. AEZ05099) were located in 6061bp small plasmid pINCan01 (AN:JN596279) of Klebsiella oxytoca in association with blaGES-11 and sul1 mdr genes . Two genes for aminoglycoside acetyl transferases (aacA5 and aadA7) were located in Pseudomonas 2903bp class I integron in association with blaVIM-2 and dhfr genes, involved in carbapenem and trimethoprim resistance respectively [40-44]. Two aminoglycoside 6'-acetyltransferase type Ib (aac6’-1b; 172aa) were cloned from Achromobacter xylosoxidans (AN:AY686225) as 3436bp class I integron with also blaVIM-2 gene. A 281 amino acids aacA8 gene was found with aacA7 (152aa) isomers in 3608bp class I integron (AN:KJ679405) of Pseudomonas aeruginosa associated with aadA6 and blaOXA-2. There was no similarity between aacA1 vs. aacA4 of Klebsiella pneumoniae (protein Id. ADH82126) and Escherichia coli (Protein Id. BAB72153) or Pseudomonas aeruginosa (protein Id. AIP98294) and therefore Pseudomonas enzyme designated as aacA3 which was isolated in China (Figure 2 and Table 1). Neither 172aa 6’-N-acetyl transferase (aac6’-1b; protein Id. CAF18332) of Morganella morgani has similarity to aacA1 and designated as aacA4 and such enzyme in both plasmids were identical suggesting horizontal transfer but Klebsiella plasmid (AN:HM043570) was partially sequenced (38-44). The few new aminoglycoside resistance gene, designated aac(6')-Iae, encoded a 183-amino-acid protein that shared 57.1% identity with AAC(6')-Iq. Such Escherichia coli expressing exogenous aac(6')- Iae showed resistance to amikacin, dibekacin, isepamicin, kanamycin, netilmicin, sisomicin, and tobramycin but not to arbekacin, gentamycin or streptomycin (Figure 1 and Tables 1-4) . 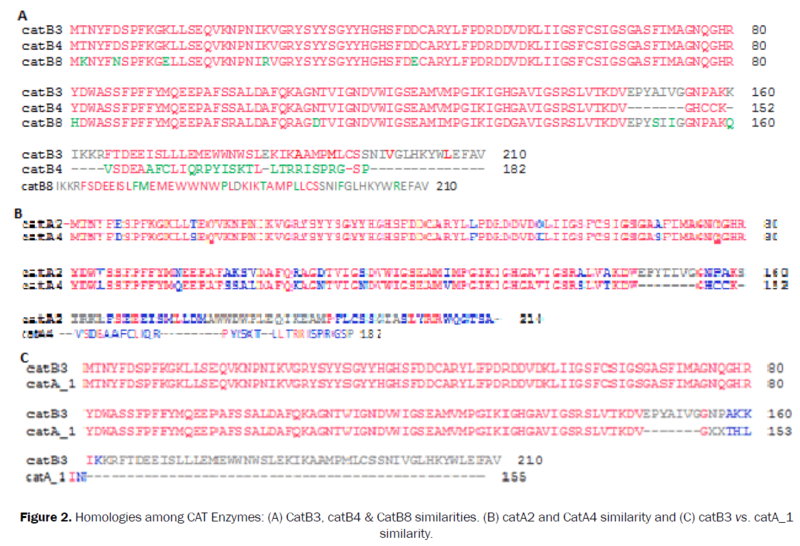 Figure 3: Similarities among aacA1 enzymes: (A) aacA1 vs. AaacA4 with terminal truncation with point mutations. (B) aacA1 vs. aacA5 with internal deletions and no similarity. (C) No similarities among aacA5, aacA6 and aacA8 and (D) no similarity between aacA5 vs. aacA6. Aminoglycoside 3’-N/-O--acetyl transferases were isolated from various microorganisms where it was found both in plasmids and chromosomes [46-55]. aacC1 enzyme was isolated from 2324bp plasmid R1033 of many Enterobacteriaceae and were aac(3)’- 1a type (AN:CAA33850) . aacC2 (EC:2.3.2.81) of Escherichia coli was cloned from a Moscow isolate (AN:X54723; Protein Id. CAA38525) . A 310 amino acids length Escherichia coli aac3’ enzyme (protein Id. ESD46483) was isolated in genome fragments (Accession nos. AXTL01000004 and ADTS01000075). Pseudomonas aeruginosa aac(3’)-1b enzyme was 176 aa and likely partial (protein Id. AAA88422) . aacC3 isomers (aac3’-IIIa/b/c) were cloned from Pseudomonas aeruginosa (ANs. X55652, L06160 and L06161)  and aac3’-Vb was sequenced from Serratia marcescens genomic fragment and the enzyme had 72% similarity to aac3’-Va and gave high label resistance to gentamycin, netimicin and moderate resistance to tobramycin (protein Id. AAA26548) . Similarly, aac3’-VIa gene (AN:M88012) was cloned from Enterobacter cloacae large plasmid with 39% and 48% similarities to aac3’-VII and aac3’-II respectively [51,52]. Similarly, aac3’-VIa enzyme was found 299 aa (protein Id. AAA16194). aacC7 (protein Id. AAA88552), aacC8 (protein Id. AAA26685) and aacC9 (protein Id. AAA25334) genes were isolated from Streptomyces rimosus (AN:M22999), Streptomyces fradiae (AN:M55426) and Micromonospora chalcea (AN:M55427) (Figure 3 and Table 2) [53,54]. AAC(3)-XI, a new aminoglycoside 3-N-acetyltransferase from Corynebacterium striatum was isolated recently . An Acinetobacter baumannii aac2’’ acetyl transferase (286aa; protein Id. AAA21890) was identified . Also a chromosomally encoded aminoglycoside 2'-N-acetyltransferase (AAC(2')-Ic) from Mycobacterium tuberculosis was isolated [57-61]. Similarities among aac6’-1b-cr enzymes that mediates fluoroquinolone resistance. Aminoglycoside acetyltransferase, AAC(6')-Ib reduces the activity of ciprofloxacin by N-acetylation at the amino nitrogen on its piperazinyl substituent . AAC(6′)-Ib-cr differs from AAC(6′)- Ib, by two specific codon exchanges Trp102→Arg and Asp179→Tyr, which have been found to be necessary and sufficient for the ciprofloxacin resistance phenotype . Among 313 Enterobacteriaceae from the United States, aac(6′)-Ib-cr was detected in 15 (32%) of 47 E. coli isolates, 17 (16%) of 106 K. pneumoniae isolates, and 12 (7.5%) of 160 Enterobacter isolates . ESBL Escherichia coli were isolated from poultry farm in Switzerland associated with fluoroquinlone resistance due to aac6’-Ib-cr acetyl transferase. Aac6’-1b-cr enzyme present in pKPS30 plasmid (AN:KF793937; nt. 22991-23509) of Klebsiella pneumoniae . Enterobacter aerogenes isolates associated with variable expression of the aac(6')-Ib-cr gene was reported giving high label fluoroquinilones resistance . A Korean study indicated the presence of aac(6’)-1b-cr variant enzyme in E. coli and K. pneumoniae and few strains simultaneously contained aac(6’)-1b and aac6’-1b-cr with resistant to tobromycin, kanamycin and amikacin (Figure 1) . Other mechanisms for fluoroquinolone resistance were target protection by qnrA1/B1/S1 proteins (has high affinity for ciprofloxacin) and active drug efflux by QepA and OqxAB pumps (remove ciprofloxacin from bacterial cytoplasm) . Salmonella enterica plasmid also detected aac6’-1b-cr gene (AN:KM877269; nt. 119381-119965, complement). Discovery of Enterococcus facium aac6'-aph2’’ bifunctional aminoglycoside modifying enzyme in 70 kb plasmid containing transposon Tn5281 and IS256 element was phenomenon . All E. facium strains from United Kingdom had showed high level gentamycin resistance with many MDR genes and multiple conjugative plasmids were detected as demonstrated by Pulse- Field Gel Electrophoresis (PFGE) and hybridization studies [68-71]. A French study isolated Staphylococcus aureus strains with aminoglycoside resistance and had both aac6’-aph2’’ hybrid and aph3’-III genes (phospho transferases) located chromosomally . A turkish study with 358 genetamycin resistant Staphylococcus aureus showed 334 aac-aph type bifunctional acetylating enzyme . A US-study indicated high level aminoglycoside resistance in Enterococcus fecalis due to aac6’-aph2’’ enzyme causing both gentamycin and streptomycin resistance but streptomycin resistance conferred due to other aph3’-III/aph5’’-III type genes . Shigila sonnei genome has aac6’-aph2’’ bifunctional enzyme (protein Id. CSO06978) with similarity to aacA4 enzyme (EC:2.3.1.82) of Proteus vulgaris (protein Id. WP_058127929), Escherichia coli (protein Id. CRL66321), Acinetobacter johnsoni (protein Id. ALV74709) or Pseudomonas aeruginosa (protein Ids. CBI63199, CBL95252 and ALI59095). Entercoccus faecalis chromosome islands carried bi-functional acetyl transferases (aacA-aphD; protein Id. ANN02929), streptothricin acetyl transferase (Sat4; Protein Id. ANN02919) including many adenyl tramsferases (Protein Ids. ANN02918, ANN02921, ANN02922 and ANN02927), streptomycin phosphotransferase (aphA3) and ISA(E) gene that conferred resistant to pleuromnticin, streptrogramin and incosamide antibiotics . Bifunctional aminoglycoside-modifying enzyme like aminoglycoside (6')acetyltransferase-Ie/ aminoglycoside 2″-phosphotransferase-Ia (AAC(6')-Ie-APH(2″)-Ia) from Gram-positive cocci, (was isolated that conferred resistance to the 4,6-disubstituted aminoglycosides kanamycin, tobramycin, dibekacin, gentamycin, and sisomicin, but not to arbekacin, amikacin, isepamicin, or netilmicin . A recently discovered bifunctional antibiotic-resistance enzyme named AAC(3)-Ib/AAC(6')- Ib', from Pseudomonas aeruginosa, catalyzes the acetylation of aminoglycoside antibiotics. The AAC(3)-Ib domain appears to be highly specific to fortimicin A and gentamicin as substrates, while the AAC(6')-Ib' domain exhibits a broad substrate spectrum [76-79]. strA and strB genes could inactivate the streptomycin by phosphorylation. Phospho-streptomycin could not bind bacterial ribosome and such bacteria could grow at as high as 100 μg/ml streptomycin giving AMR . Sequence analysis suggested there was no similarities between catB3 vs. strA/B and aac6’/3’ vs. strA/B. The aminoglycoside phosphotransferase (aph gene) phosphorylate the antibiotics so that phosphorylated kanamycin, amikacin and neomycin could not kill the bacteria. There was also no similarity between AG acetyl transferase (aacA1/aacC1) with 264aa neomycin phosphotransferase (aph3’-Ia, Protein Id. CAA23892) and 341aa hygromycin phospho transferase (hygA, protein Id. AHC55481). However, streptomycin phosphotransferases (strA, 278aa and strB, 276aa; protein Ids. AAA26443 and CED95338) have only 28% similarities within 72% and 37% cover respectively [81,82]. Similarity of dug acetylating enzymes with drug adenylation enzymes. The aminoglycoside adenyl transferase [EC:2.7.7.47] was present in many bacterial plasmids of diverse bacterial species of Escherichia (ANs:HG41719, KJ484637, KM377239), Klebsiella (ANs:KF914286 and KF719970), Salmonella (AN:JQ899055) and Acinetobacter (AN: KM401411), but also present in some bacterial chromosome as in Salmonella enterica . Antibiotic adenyl transferase (~263aa) adenylate drugs at 6-N position and conferred bacteria resistant to aminoglycoside antibiotics like streptomycin and amikacin . Such enzymes seem Rel-Spo-like super family and do not have much similarity to the AG 3’/6’ N-acetyl transferases and catB3 enzyme. Interestingly, adenyl transferases have similarity across the species and also notably exists as different isomers (aadA1 to aadA17) with 50-80% sequence similarities among itself [85,86]. Beta-lactamases are very diverged enzymes with at least twenty distinct isomers including TEM, OXA, NDM1 and CTX-M . Metallo β-lactamases (VIM, IMP, NDM1, SPM, GIM, DIM) are very deadly as resistant to imipenem and beta-lactamase inhibitors cavulinate and sulbactam . BLAST analysis found no similarities between AG acetyl transferases and β-lactamases . GenBank (www.ncbi.nlm.nih.gov) search indicated (Table 4) that each single conjugative plasmid carried multiple drug acetylating enzymes (cat, aac) in association with many beta-lactamase genes as well as strA/B, sul1/2 genes (10). As for example, Salmonella enterica plasmids (pIncH12 and pHXY40908) accquired four (aac6’-1b, catB3, aaC3, catA1) and three (aac3’-IV, aac6’-1b-cr, catB3) drug acetylating enzymes (accession nos. LN794248, KM877269). Table 4 profoundly indicated how seriously multiple mdr genes had gathered in plasmids of many common pathogens that no drug would work to cure such bacterial infections. A 143aa long acetyl transferase was isolated from A. baumannii (AN:JFWP02000007; nt. 103508-103939) with similarity to aac6’-like enzyme (protein Id. EXT17036). Acinetobacter genomospecies aac6’-Ir enzyme (protein Id. WP_063840327) has 79% similarity to aac6’-Is (protein Id. AHD03491) but aac6’-It, aac6’-Iw, aac6’-Ix and aac6’-Iu have 83%, 85%, 90% and 94% similarities to aac6’-Is respectively (protein Ids. WP_063840329, WP_005296085, ALB75422 and WP_063840330) [88,89]. Aeromonas hydrophila genome (AN:LNUR01000009; nt. 843037-843495) has an unique 152aa 6’-acetyl transferase with limited similarity (47%) to aac6’-Ih of A baumannii (protein Id. ALB75422). Pesudomonas saponiphila genome (AN:FNTJ01000001; nt. 257741- 258187) also has148aa long 6’-acetyl transferase (protein Id. SEB43247) with 51% similarity to A. baumannii aac6’-Ih enzyme (protein Id. ALB75422). We see seven mutations in Aeromonas hydrophila aac6’-I enzymes (ANT67440 vs. KWR67119) with 95% similarities. However, 26 mutations in Aeromonas piscicola aac6’ enzyme (protein Id. KWR67119) at the NH2 -termianl 60 amino acid region (WP_065401184 vs. KWR67119). A 194aa long aac6’-Ia enzyme of Wohlfahrtiimonas chitiniclastica has 9aa signalling peptide at the NH2 terminus and very similar to aacA1 enzyme of E. coli plasmid pCMXR1 (AN:AB061794) except one point mutation (V84I). But 185 aa E. coli aacA1 enzyme (protein Id. BAB72153) has only 55% similarity with 185 aa long Klebsiella pneumoniae aac6’-Iai enzyme (protein Id. WP_032495046). Such unusual aacA43 enzyme has two different mutations in A. baumannii ((I2S, K141N; protein Id. WP_024437351) and P. aeruginosa (R20Q, R95K; protein Id. WP_071846376). Several mutations in many Enterobacteriaceae aacA4 enzymes (aac6’-1b type) were reported with respect to Escherichia coli enzyme (protein Id. ABP35556). Different point mutations were found in Pseudomonas aeruginosa (A75G; protein Id. WP_071846301), (S83G; protein Id. WP_071846385) and (T132A, K133R; protein Id. WP_071593232). Similarly in E. coli aacA4 enzyme, a single mutation (Q101L; protein Id. WP_069985732) was reported and also in Enterobacter hormachei (R181C; protein Id. WP_07220113) and in Pseudomonas putida (Q49R; protein Id. WP_071984682). A 197aa long aacA4 enzyme (protein Id. AKJ19116) in P. aeruginosa plasmid pMRVIM0713 (AN:KP975076) had extended 13 aa and two mutations (M1V and S102L) were reported. Such NH2-terminal fusion were found frequently as in P. aeruginosa integron-mediated 203aa long aac6’-1b enzyme (protein Id. AAC46343; AN:U59183) and also in 210 aa long enzyme (protein Id. CBI63203; AN:FN554980). A chromosome mediated Acinetobacter baumannii 216aa long aacA4 enzyme (protein Id. EKA73751) with similar M1V and S102L mutations was also reported (Figure 3). A 183aa long aacA16 N(6’)-acetyl transferase (protein Id. WP_001109644) has only 60% similarity with aacA43 enzyme of many Enterobacteriaceae (protein Ids. WP_063840279; WP_024437351). Such enzyme has 60% similarity with the Citrobacter freundii aac6’-I1 enzyme (protein Id. CAA91010; AN:Z542441) with most divergent at the NH2-terminus. As such enzymes have only 55-65% similarity with the aacA1 enzymes (protein Id. BAB72153), their association in aac6’-I class was not therefore justified (>60 mutations). AacC1 enzyme of Enterobacteriaceae is 177 amino acids (protein Id. CAA33850) and has similarity to Acinetobacter baumannii gentamycin N-3’-acetyl transferases having different mutations reported in different isolates: In one isolate (protein Ids. WP_031950771, EXD70625 and WP_000441892) with three mutations (R98K, P102A, T175P). In Pseudomonas aeruginosa, aacC1 enzyme has many mutations reported. As for example, one isolate has S23R, K74R, D83E mutations (protein Id. WP_052158612); in another K38Q, D83E, E165D mutations (protein Id. WP_063840256) and in another (protein Id. ALE32149) five mutations (K38Q, D83E, R98K, P102A, and E165D) with few common mutations. However, less conserved enzymes have 71-73% similarities (protein Ids. ABN10340 and CRQ60998). Salmonella enterica aacC1 enzyme (protein Id. WP_032491356) has three mutations with two very common (S104I, R98K and P102A) and in another, two mutations were detected (P152T, S81I; protein Id: WP_032491356). An A. baumannii and P. aeruginosa AAC(3)-I enzyme have P152T common mutation (protein Ids: WP_052133400 and WP_063840258). E. coli 158aa long AAC3’-acetyl transferase has two mutations (A53G, R234Q) that induces apramycin resistance (protein Id. WP_064756331) and also in K. pneumoniae (W5L, A53G; protein Id. WP_064735602). But in another E. coli mutant three mutations (A53G, H241R, G246E ; protein Id. WP_072833186) and in another four mutations (A53G, K177N, L178C, D182E; protein Id. WP_072739411) were reported. AAC(3)-I enzyme of Serratia marcescens (178aa; protein Id. OCO95380) and Enterobacter cloacae (178aa; protein Id. WP_032663836) have only 73% similarity with 22aa signalling protein at the NH2 terminus suggesting those enzymes are diverged aac3’-Ia type. Even both enzymes are 178aa long with 88% identity, have 22 mutations demonstrating drug acetyl transferases are indeed involved rapidly similar to β-lactamases (Figure 4). Figure 4: Sequence alignment of different AAC3’ drug acetyl transferases. ESD46483 (E. coli chromosomal aacC1 protein, 308aa, AN:AXTL01000004); AAA21890 (A. baumannii aacC2 protein, 286aa; AN:M62833); CAD27711 (E. coli aacC4 protein, 261aa, pHK11-apra vector; AN:AJ438947); CAA33850 (Enterobacteriaceae plasmid mediated aacC1 protein, 177aa: AN:X15852); CAA38525 (E. coli aacC2 protein, 286aa; AN:X54723); CAA39184 (P. aeruginosa aacC3, 271aa; AN:X55652); AAA26682 (P. aeruginosa aacC3b protein, 245aa; AN:L06160); AAA25683 (P. aeruginosa aacC3c protein, 279aa; AN:L06161); AAA26548 (C. marcescens aacC5b protein, 269aa; AN:M97172); AAA16194 (E. cloacae aacC6 protein, 299aa;AN:M88012); AAA88552 (S. rimosus aacC7 protein, 288aa, AN:M22999); AAA26685 (S. fradiae aacC8 protein, 286aa; AN:M55426); AAA25334 (M. Chalcea aacC9 protein, 281aa; AN:M55427); BAA78619 (S. greseus kan gene. 284aa, AN:AB028210). The 286 amino acids length Escherichia coli aacC2 (protein Id. CAA38525) was found similar to aac(3’)-IIc enzyme of E. coli (protein Id. WP_063840266) but no similarity to aacC1 enzyme. Escherichia coli aacC2 enzyme (protein Id. AFI72859) had four (L14F, H275Q, E276K) and ten mutations (T11L, R12Q, K78E, P84L, A162T, N194D, E204D, A268P, A274V, Q278E) with the similar aac3’-IId (protein Id. ABS70977) and aac3’-IIe (protein Id. ABS70978) enzymes respectively. Among the Enterobacteriace aac3’-II enzymes several mutations were reported (T87A, A112T, T132S, A245V; see Protein Ids. WP_00988063; WP_051421733; KTQ31168). In Salmonella enterica enzyme 4bp deletion and T132S mutation were reported (protein Id. WP_060588432). No mutation was found between K. pneumoniae and E. coli aacC2 enzymes (AGP03376 vs. ODH13880). Other aac(3’)-II enzymes reported in Klebsiella pneumoniae and Acinetobacter baumannii were shown very similar mutations indicating a horizontal transfer of such genes from E. coli plasmid by conjugation. The mutations in K. pneumoniae (protein Ids. AGP03376 and WP_031944095) were; L11I, Q12R, R70L, T79A, R183W, S193R, D204E, T270A, V277A, E279Q, and C280R. The mutations in A. baumannii (protein Ids. WP_057690920 vs. WP_002063884) were E142K, G184V, D186X but with Escherichia coli plasmid-mediated aacC2 enzyme (protein Id. CAA38525) 14 mutations were reported (L11I, Q12R, R70L, T79A, K135E, R183W, V184G, Y186D, S193R, D204E, T270A, V277A, E279Q, and C280R). In Enterobacter sp strain 50858885 similar mutations were reported as follows: L11I, Q12R, R70L, K78E, K135E, T79A, P84L, K135E, R183W, S193R, T270A, V277A, E279Q and C280R. Although Shigella flexneri (protein Id. ADY02606) had very similar mutations but much more mutations (only 76% similarity) were found in Salmonella enterica enzyme (protein Id. WP_061873001) and 85% similarity to Sinorhizobium melilti (protein Id. WP_003525983) aac3’-II enzyme. However, numerous mutations were reported in aac(3’)-III enzymes (EC:2.3.1.81) of E. coli conjugative MDR-plasmid pRCS57 (143225bp; AN:LO017738) as follows: L11I, Q12R, R70L, T79A, K135E, R183W, S193R, D204E, T270A, V277A, E279Q, and C280R (protein Id. CRH08791). Such plasmid has also had mrx macrolide resistant protein, mphR repressor, blaTEM-1 and tetA tetracycline efflux protein as well as Tnp and Tra genes including many IS-elements. Interestingly. a 308aa aac3’-III-like E. coli enzyme (protein Id. EGB89811) had extended 9aa at the NH2 terminus and very similar to other Enterobacteriaceae 294aa aac3’- III enzyme (protein Id. WP_013023858). An 172aa long aacC4 enzymes of E. coli (protein Id. ACS75040) and P. aeruginosa (protein Id. AGG23542) were found two mutations R107Q, D170S and M54L, D170S respectively. Stenotrophomonas maltophila had D170M point mutation (protein Id. ABN48565; AN:EF210035). Acinetobacter baumannii genome had reported 210aa 38aa N-terminal extended aacA4 enzyme with D170S, O171V mutations. Citrobacter freundii plasmid pMRVIM1012 had 34aa N-terminal extended aacC4 enzyme with L90S, D170S mutations. Achromobacter xylosoxidans 19.8kb plasmid mediated 210aa aacA4 enzyme (protein Id. BAV17747) had also similar mutations (L90S, D170S). Similar mutation further reported in Serratia marcescens class-3 integron 188aa long aacC4 enzyme likely due to 16aa extension (protein Id. AAL10408) and also in Vibrio cholerae 192aa aacA4 enzyme (protein Id. AAM52493), suggesting similar integron/plasmid involved in conjugation to transfer aacA4 genes. Certainly such extended enzymes had not proved by the protein product analysis and reflects wrong reporting as judged by plasmid mediated shorter active enzymes reported (Table 1). Other Escherichia coli extended aac3’-IV enzymes (258aa) have several point mutations (Y188H, R236Q; WP_064770919 vs. WP_064756331) and (A53G, A216G; WP_064769430 vs. WP_064769895) and (A53G, A241R, G247E; WP_064769430 vs. WP_072833186). A genomic clone of S. enterica may code 266 aa enzyme with NH2 terminal extension of 8aa and M1V and common A53G mutations (AN:LHLZ01000022; protein Id. KNT82816). Similarly, in K. pneumoniae genome (AN: MPWC0100123 and JMXV01000021) two aacC4 enzymes (protein Ids. OKB98731 and KDJ63161) were predicted with 255 and 254 aa long and had common A53G point mutation. Aac3’-VI enzyme of E. coli differs with single point mutations at T132S and A244V of E. cloaceae aacC6 enzyme (protein Ids. WP_053271189 vs. AAA16194) and insertions in Salmonella enterica genome may code for different acetyl transferases (protein Ids. KNK91744 and EHC71407). Cat gene was introduced in many DNA vectors: As for example BAC vector pHL931 (protein Id. ALV82398); Gateway vector pB4cCGGW for plant (protein Id. BAV44483); pDONRpEX18Gm expression vector (protein Id. AJW82929); orf selection vector pSOS (protein Id. ABK62679) and so many to state. AacC1 gene (177aa) was cloned in varieties of expression vectors like pMQ175 (AN:FJ380062), pCVD001 (AN:KM017942), pSX (AN:JN703735), pUCP24 (AN:HM368668), and also in association with Beta-lactamase gene like pEX18gmGW (AN:KM880127), pLOXGen4 (AN:AJ401048); and in association with cat gene like pMpGWB236 (ANLC057515), pJM101 (AN:KX782328); and in association with AG phospho transferase gene like pBG51 (AN:KT192133) and pVZ324 (AN:AF100177). AacA4 gene (267aa) was also cloned in suicidal vector pSUI3 (AN:KX863720) and in BAC vector pHL931 (AN:KT362048) and in cloning vector pHK11-apra (AN: AJ438947) 263aa long aacA4-type gene was dissimilar at amino and carboxy terminals. Wide spread use of mdr genes in plasmids should be controlled as recombinant drug resistant bacterial isolates might be released into environment. We see wide spread presence of AAC enzymes in plasmids and chromosomes of household bacteria. Recently Hasani et al. evaluated aminoglycoside resistance in 87 Acinetobacter baumannii strains isolated from four hospitals of Iran and was found aac(3')-Ia predominant sequence group (SG) including ANT(2')-Ia and. APH(3')-Via. APH(3’-Ia related to resistance against amikacin and kanamycin, whereas ANT(2')-Ia was related to the resistance for gentamycin and tobramycin in SG2 and tobramycin resistance was correlated with aac(6')-Ib . Many cellular N-acetyl transferases (NAT2) are known but are different than CAT and AAC enzymes. Corynebacterium striatum BM4687 was resistant to gentamicin and tobramycin but susceptible to kanamycin A and amikacin. A novel 3-N-acetyltransferase type XI was purified and sequenced with 60% amino acid identity with acety ltransferases . The purified protein acetylated dibekacin to the amine at the C-3 position Many chromosomal enzymes designated as aacA9, aacA16, aacA30, aacA41, aacA43 etc. were reported but further needed for placement . Further, an unique bi-functional acetylating enzyme, aac(6’)-Ie-aph2’’-I was detected in Staphylococci cassette chromosome  as well as Enterococcei clinical isolates in China  and Campilobacter isolates in USA. Thus it was concluded that drug acetyl transferases were highly diversified. Cat gene although had minimum divergence but 3’- and 6’- acetyl transferases (aacA1/C1) were arose very highly similar to very diversified β-lactamase (bla) genes (Chakraborty, 2016). Functional analysis of aminoglycoside acetyl transferases mutants, however less explored. Because such genes were associated with MBLs and acrAB/CD or mexAB/XY diverged tripartite proton drug efflux genes, Never the less, cmlA2 chloramphenicol transporter was also detected in 23kb plasmids like pRYC103T24 (AN:GQ293500; protein Id. ADC80829) of E. coli indicating chloramphenicol highly contaminated in nature and mdr gene evolution was maximum. 3-D structures and critical active site changes with better drug acetylating motifs and enlarged drugs selectivity must be addressed to design new drug against superbugs. AMR had reached an alarming label worldwide and all mdr genes must be assessed carefully at the molecular level. More importantly, three rings of aminoglycosides with many –OH and -NH2 groups of acetylation were designated as (I=1’- 6’, upper), (II=1-6, middle) and (III=1’’-6’’, lower) but the number of acetylating preferences would be determined carefully. Although drug phospho transferases and adenyl transferases could act very similarly to various O- and N-atom of the drugs but such enzymes had no similarity to aacC1 or aacA1 type enzymes indicating drug modifying enzymes indeed strongly diversified . Presently, no de-acetylase enzyme was reported in MDR plasmids. Thus super conjugative plasmids with deacetylase genes could be used as a control measure to combat drug modifying superbugs that were contaminated highly in air and water. We are studying acetyl transferases in multi-drug resistant bacteria from Kolkata Ganga River and data indicates multiple isomers are present. In essence, mdr genes like drug acetyl transferases have created a very serious problem in human health and safety. It appears new drug development should be accelerated but alternate strategies like development of phyto-antibiotics, gene medicines (antisense, ribozyme, dicer-casper, miRNA) and DNA nanotechnology applications also should adapted in R&D research of India and other Asian countries with population burden. We thank Dr. Smarajit Maity for help during the study and also thank Dr. J B Medda for financial support. Chakraborty AK. Multi-drug resistant genes in bacteria and 21st Century problems associated with antibiotic therapy. Biotechnol Ind J 2016;12:114. Shaw KJ, et al. Molecular genetics of aminoglycoside resistant genes and familial relationships of the aminoglycoside-modifying enzymes. Microbiol Rev. 1993;57:138-163. Courvalin P, et al. Resistance towards aminoglycoside-aminocyclitol antibiotics in bacteria. J Antimicrob Chemother. 1981;8:57-69. Chinault AC, et al. Characterization of transferable plasmids from Shigella flexneri 2a that confer resistance to trimethoprim, streptomycin, and sulfonamides. Plasmid. 1986;5:119–131. Shimizu K, et al. Comparison of aminoglycoside resistance patterns in Japan, Formosa, and Korea, Chile, and the United States. Antimicrob Agents Chemother. 1985;28:282–288. TeranF J, et al. Cloning, sequencing, and use as a molecular probe of a gene encoding an aminoglycoside 6'-N-acetyltransferase of broad substrate profile. Antimicrob. Agents Chemother. 1991;35 (4):714-719. Wybenga-Groot LE, et al. Crystal structure of an aminoglycoside 6'-N-acetyltransferase: defining the GCN5-related N-acetyltransferase superfamily fold. Structure. 1999;7:497-507. Hasani A, et al. Frequency of aminoglycoside-modifying enzymes and armA among different sequence groups of Acinetobacter baumannii in Iran. Microb. Drug Resist. 2016;22:347-353. Li X-Z, et al. The challenge of efflux-mediated antibiotic resistance in Gram-negative bacteria. Clin Microbiol Rev 2015;28:337–418. Chakraborty AK. Complexity, heterogeneity, 3-D structures and transcriptional activation of multi-drug resistant clinically relevant bacterial beta-lactamases. Trends Biotechnol-open access. 2016;2:1-001. Bolivar F and Backman K. Plasmids of Escherichia coli as cloning vectors. Methods Enzymol 1979; 68:245-267. Bunny KL, et al. New mobile gene cassettes containing an aminoglycoside resistance gene, aacA7, and a chloramphenicol resistance gene, catB3, in an integron in pBWH301. Antimicrob Agents Chemother. 1995;39:686-693. Moura A, et al. Novel gene cassettes and integrons in antibiotic-resistant bacteria isolated from urban wastewaters. Res Microbiol. 2012;163:92-100. Wang M, et al. Plasmid-mediated quinolone resistance in clinical isolates of Escherichia coli from Shanghai, China. Antimicrob Agents Chemother. 2003;47:2242-2248. Boyd D, et al. Complete sequence of four multidrug-resistant MOBQ1 plasmids harboring blaGES-5 isolated from Escherichia coli and Serratia marcescens persisting in a hospital in Canada. Microb Drug Resist. 2015;21:253-260. Xiong J, et al. Complete sequence of pOZ176, a 500-Kilobase IncP-2 plasmid encoding IMP-9-mediated carbapenem resistance, from outbreak isolate Pseudomonas aeruginosa 96. Antimicrob Agents Chemother. 2013;57:3775-3782. Courvalin P and Carlier C. Resistance towards aminoglycoside-aminocyclitol antibiotics in bacteria. J Antimicrob Chemother. 1981;8:57–69. Lovering AM, et al. AAC(1): a new aminoglycoside-acetylating enzyme modifying the Cl amino group of apramycin. J Antimicrob Chemother. 1987;20: 803–813. Teran F, et al. Cloning, sequencing, and uses as a molecular probe of a gene encoding an aminoglycoside 6-N-acetyltransferase of broad substrate profile. Antimicrob. Agents Chemother. 1991;35: 714–719. Champion HM, et al. Cloning and characterization of an AAC(6') gene from Serratia marcescens. J Antimicrob Chemother 1988;22:587-596. Tenover F, et al. Cloning and sequencing of a gene encoding an aminoglycoside 6-N-acetyltransferase from an R factor of Citrobacter diversus. J Bacteriol. 1988;170:471–473. Chevereau M, et al. Aminoglycoside resistance in bacteria mediated by gentamicin acetyltransferase II, an enzyme modifying the 2'-amino group of aminoglycoside antibiotics. J Biol Chem. 1974;13:598–603. Aínsa JA, et al. 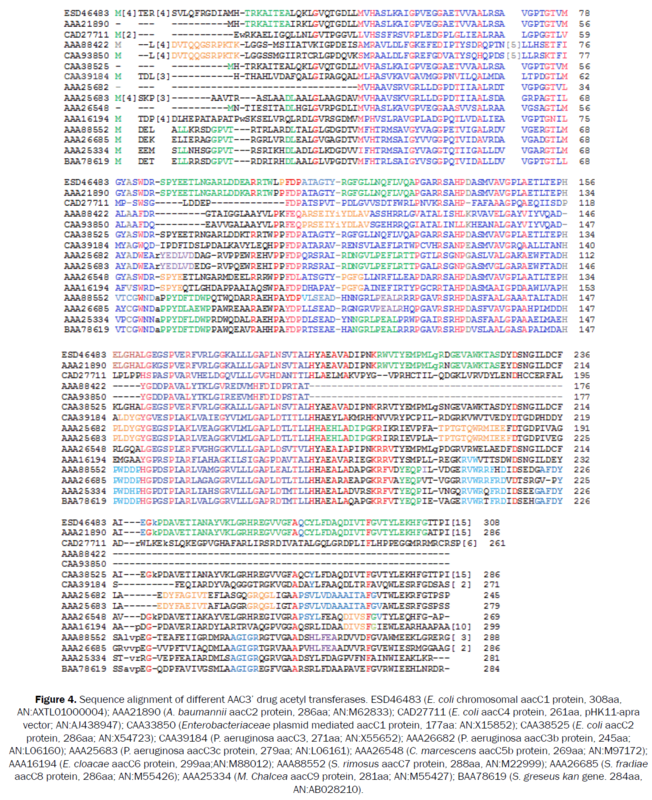 Aminoglycoside 2'-N-acetyltransferase genes are universally present in mycobacteria: characterization of the aac(2')-Ic gene from Mycobacterium tuberculosis and the aac(2')-Id gene from Mycobacterium smegmatis. Mol Microbiol. 1997;24: 431–441. Villa L, et al. Complete sequencing of an IncH plasmid carrying the blaNDM-1, blaCTX-M-15 and qnrB1 genes. J Antimicrob Chemother. 2012;67:1645-1650. Meyer JF and Wiedemann B. Characterization of aminoglycoside 6'-N-acetyltransferases [AAC(6')] from gram-negative bacteria and Streptomyces kanamyceticus. J Antimicrob Chemother. 1985;15:271–282. Nobuta K, et al. Sequencing and expression of the 6-N-acetyltransferase gene of transposon Tn1331 from Klebsiella pneumoniae. J Bacteriol. 1988;170:3769–3773. Lambert T, et al. Characterization of Acinetobacter haemolyticus aac(6)-Ig gene encoding an aminoglycoside 6-Nacetyltransferase which modifies amikacin. Antimicrob. Agents Chemother. 1993;37: 2093–2100. Thungapathra M, et al. Occurrence of antibiotic resistance gene cassettes aac(6')-Ib, dfrA5, dfrA12, and ereA2 in class I integrons in non-O1, non-O139 Vibrio cholerae strains in India. Antimicrob Agents Chemother. 2002;46:2948-2955. Tolmasky ME, et al. Genetic organization of antibiotic resistance genes (aac(6)-Ib, aadA, and oxa9) in the multiresistance transposon Tn1331. Plasmid. 1993;29: 31–40. Tran Van Nhieu G, et al. Incidence of an aminoglycoside 6-N-acetyltransferase, ACC(6)-Ib, in amikacin-resistant clinical isolates of gram-negative bacilli, as determined by DNA-DNA hybridisation and immunoblotting. J Med Microbiol. 1992;36:83–88. Schroder J, et al. Complete genome sequence, lifestyle, and multi-drug resistance of the human pathogen Corynebacterium resistens DSM 45100 isolated from blood samples of a leukemia patient. BMC Genomics. 2012;13:141-146. Hannecart-Pokorni E, et al. Characterization of the 6-N-aminoglycoside acetyltransferase gene, aac(6)-Il, associated with a sulI type integron. Antimicrob Agents Chemother. 1997;41:314–318. Casin IF, et al. Aminoglycoside 6-N-acetyltransferase variants of the Ib type with altered substrate profile in clinical isolates of Enterobacter cloacae and Citrobacter freundii. Antimicrob. Agents Chemother. 1998;42:209–215. Shaw KJ, et al. Isolation, characterization, and DNA sequence analysis of anAAC(6')-II gene from Pseudomonas aeruginosa. Antimicrob. Agents Chemother. 1989;33:2052-2062. Tada T, et al. Novel 6'-N-Aminoglycoside Acetyltransferase AAC(6')-Iaj from a Clinical Isolate of Pseudomonas aeruginosa. Antimicrob Agents Chemother. 2013;57:96-100. Tenover FC, et al. Cloning and sequencing of a gene encoding an aminoglycoside 6'-N-acetyltransferase from an R factor of Citrobacter diversus. J Bacteriol. 1988;170:471-473. Villa L, et al. Complete sequencing of an IncH plasmid carrying the blaNDM-1, blaCTX-M-15 and qnrB1 genes. J Antimicrob Chemother 2012;67:1645-1650. Wang GQ, et al. Characterization of integrons-mediated antimicrobial resistance among Escherichia coli strains isolated from bovine mastitis. Vet Microbiol 2008;127:73-78. Barrios H, et al. A plasmid-encoded class 1 integron contains GES-type extended-spectrum beta-Lactamases in Enterobacteriaceae clinical isolates in Mexico. Antimicrob. Agents Chemother. 2012;56:4032-4034.
el Solh N, et al. Molecular cloning and analysis of Staphylococcus aureus chromosomal aminoglycoside resistance genes. Plasmid. 1986;15:104-118. Bunny K, et al. New mobile gene cassettes containing an aminoglycoside resistance gene, aacA7, and a chloramphenicol resistance gene, catB3, in an integron in pBWH301. Antimicrob. Agents Chemother. 1995;39:686–693. Lambert T, et al. Characterization of the chromosomal aac(6')-Ij gene of Acinetobacter sp. and the aac(6')-Ih plasmid gene of Acinetobacter baumannii. Antimicrob. Agents Chemother. 1994;38:1883-1889. Bunny KL, et al. New mobile gene cassettes containing an aminoglycoside resistance gene, aacA7, and a chloramphenicol resistance gene, catB3, in an integron in pBWH301. Antimicrob. Agents Chemother. 1995;39:686-693. Centron D and Roy P. Characterization of the 6-N-acetyltransferase gene aac(6)-Iq from the integron of a natural multiresistance plasmid. Antimicrob. Agents Chemother. 1998;42:1506–1508. Sekiguchi J, et al. Multidrug-resistant Pseudomonas aeruginosa strain that caused an outbreak in a neurosurgery ward and its aac(6')-Iae gene cassette encoding a novel aminoglycoside acetyltransferase. Antimicrob. Agents Chemother. 2005;49:3734-3742. Salauze D, et al. Characterisation of aminoglycoside acetyltransferase-encoding genes of neomycin-producing Micromonospora chalcea and Streptomyces fradiae. 1991;101: 143-148. Lopez-Cabrera M, et al. Isolation and nucleotide sequencing of an aminocyclitol acetyltransferase gene from Streptomyces rimosus forma paromomycinus. J Bacteriol. 1989;171:321-328. Vliegenthart JS, et al. Nucleotide sequence of the aacC3 gene, a gentamicin resistance determinant encoding aminoglycoside-(3)-N-acetyltransferase III expressed in Pseudomonas aeruginosa but not in Escherichia coli. Antimicrob Agents Chemother. 1991;35:892-897. Nemec A, et al. Diversity of aminoglycoside re-sistance genes and their association with class 1 integrons among strains of pan-Euro¬pean Acinetobacter baumannii clones. J Med Microbiol. 2004;53:1233-1240. Wolf E, et al. Crystal structure of a GCN5-related N-acetyltranferase: Serratia marcescens aminoglycoside 3-N-acetyltransefrase. Cell. 1998;94:439–449. Wright GD and Ladak P. Over expression and characterization of the chromosomal aminoglycoside 6'-N-acetyltransferase from Enterococcus faecium. Antimicrob. Agents Chemother. 1997;41:956–960. Weems JJ, et al. Molecular epidemiology of nosocomial, multiply aminoglycoside resistant Enterococcus faecalis. J Antimicrob Chemother. 1989;24:121-130. Rather PN, et al. Cloning and DNA sequence analysis of an aac(3)-Vb gene from Serratia marcescens. Antimicrob Agents Chemother. 1992;36:2222-2227. Rather PN, et al. Analysis of the aac(3)-VIa gene encoding a novel 3-N-acetyltransferase. Antimicrob Agents Chemother. 1993; 37:2074-2079. Galimand M, et al. AAC(3)-XI, a new aminoglycoside 3-N-acetyltransferase from Corynebacterium striatum. Antimicrob Agents Chemother. 2015;59:5647-5653. Tolmasky ME, et al. Transposon-mediated amikacin resistance in Klebsiella pneumoniae. Antimicrob. Agents Chemother. 1988;32:1416–1420. Tolmasky ME and Crosa JH. Tn1331, a novel multiresistance transposon encoding resistance to amikacin and ampicillin in Klebsiella pneumoniae. Antimicrob. Agents Chemother. 1987;31:1955–1960. Payie K, et al. Contribution of gentamicin 2'-N-acetyltransferase to the O acetylation of peptidoglycan in Providencia stuartii. J Bacteriol. 1995;177:4303–4310. Hegde SS, et al. Overexpression and mechanistic analysis of chromosomally encoded aminoglycoside 2'-N-acetyltransferase (AAC(2')-Ic) from Mycobacterium tuberculosis. J Biol Chem. 2001;276:45876-46881. Vetting MW, et al. Aminoglycoside 2'-N-acetyltransferase from Mycobacterium tuberculosis in complex with coenzyme A and aminoglycoside substrates. Nat Struct Biol. 2002;9:653-658. Miller GH, et al. The most frequently occurring ami-noglycoside resistance mechanisms com¬bined results of surveys in eight regions of the world. The Aminoglycoside Resistance Study Groups. J Chemother. 1995;7:17-30. Robicsek A, et al. Fluoroquinolone-modifying enzyme: a new adaptation of a common aminoglycoside acetyltransferase. Nat Med. 2006;12: 83–88. Compain F, et al. Complete Nucleotide Sequence of Two Multidrug-Resistant IncR Plasmids from Klebsiella pneumoniae. Antimicrob Agents Chemother.2014;58:4207–4210. Park CH, et al. Prevalence in the United States of aac(6')-Ib-cr Encoding a Ciprofloxacin-Modifying Enzyme. Antimicrob Agents Chemother. 2006;50:3953-3955. Rodríguez-Martínez JM, et al. Plasmid-mediated quinolone resistance: Two decades on. Drug Resist Updat. 2016;29:13-29. Ruiz E, et al. Changes in ciprofloxacin resistance levels in Enterobacter aerogenes isolates associated with variable expression of the aac(6')-Ib-cr gene. Antimicrob Agents Chemother. 2012;56:1097-1100. Simjee S, et al. Plasmid heterogeneity and identification of a Tn5281-like element in clinical isolates of high-level gentamicin-resistant Enterococcus faecium isolated in the UK. J Antimicro Chemother. 1999;43:625-635. Ferreti J, et al. Nucleotide sequence analysis of the gene specifying the bifunctional 6-aminoglycoside acetyltransferase 2-aminoglycoside phosphotransferase enzyme in Streptococcus faecalis and identification and cloning of gene regions specifying the two activities. J Bacteriol. 1986;167:631–638. Rouch DA, et al. The aacA-aphD gentamycin and kanamycin resistance determinant of Tn4001 from Staphylococcus aureus: expression and nucleotide sequence analysis. J Gen Microbiol. 1987;133:3039-3052. Khan SA, et al. Detection of aacA-aphD, qacEd1, marA, floR, and tetA genes from multidrug-resistant bacteria: Comparative analysis of real-time multiplex PCR assays using EvaGreen(®) and SYBR(®) Green I dyes. Mol Cell Probes. 2011;25:78-86. Boehr DD, et al. The molecular basis of the expansive substrate specificity of the antibiotic resistance enzyme aminoglycoside acetyltransferase-6'-aminoglycoside phosphotransferase-2". The role of ASP-99 as an active site base important for acetyl transfer. J Biol Chem. 2003;278:12873-12880. Yildiz Ö, et al. Antimicrobial susceptibility and resistance mechanisms of methicillin resistant Staphylococcus aureus isolated from 12 Hospitals in Turkey. Ann Clin Microbiol Antimicrob. 2014;13:44. Weems JJ Jr, et al. Molecular epidemiology of nosocomial, multiply aminoglycoside resistant Enterococcus faecalis. J Antimicrob Chemother. 1989;24:121-130. Mir AR, et al. Identification of genes coding aminoglycoside modifying enzymes in E. coli of UTI patients in India. Scientific World J. 2016:1875865. Kim C, et al. Mechanistic characterization of the bifunctional aminoglycoside-modifying enzyme AAC(3)-Ib/AAC(6')-Ib' from Pseudomonas aeruginosa. Biochemistry. 2007;46:5270-5282. Toth M, et al. Novel aminoglycoside 2''-phosphotransferase identified in a gram-negative pathogen. Antimicrob Agents Chemother. 2013;57:452-457. Davies J and Wright GD. Bacterial resistance to aminoglycoside antibiotics. Trends Microbiol 1997;5:234-240. Thompson CJ and Gray GS. Nucleotide sequence of a streptomycete aminoglycoside phospho-transferase gene and its relationship to phosphotransferases encoded by resistance plasmids. Proc Natl Acad Sci. U.S.A. 1983;80:5190-5194. Matsuhashi Y, et al. Aminoglycoside 3'-phosphotransferases I and II in Pseudomonas aeruginosa. J Antibiot (Tokyo) 1975;28:442-447. Hollingshead S and Vapnek D. Nucleotide sequence analysis of a gene encoding a streptomycin/spectinomycin adenylyltransferase. Plasmid. 1985;13:17–30. Lambert T, et al. Characterization of the chromosomal aac(6)-Iz gene of Stenotrophomonas maltophilia. Antimicrob Agents Chemother. 1999;43:2366–2371. Shaw KJ, et al. Characterization of the chromosomal aac(6')-Ic gene from Serratia marcescens. Antimicrob. Agents Chemother. 1992;36:1447-1455. Costa Y, et al. Characterization of the chromosomal aac(6')-Ii gene specific for Enterococcus faecium. Antimicrob Agents Chemother. 1993;37:1896-1903. Rudant E, et al. Characterization of the aac(6')-Ik gene of Acinetobacter sp. 6. FEMS Microbiol. Lett. 1994;124:49-54. Lambert T, et al. Characterization of the chromosomal aac(6)-Ij gene of Acinetobacter sp. 13 and the aac(6)-Ih plasmid gene of Acinetobacter baumannii. Antimicrob. Agents Chemother. 1994;38:1883–1889. Chakraborty AK. In silico analysis of hotspot mutations in the bacterial NDM-1 and KPC-1 carbapenemases that cause severe MDR phenotypes. Biochem Biotechnol Res. 2016;4:17-26. Ilin AI, et al. Complete genome sequence of multidrug-resistant new medicinal drug FS-1. Genome Announc. 2015;3:e01272-15. Chakraborty AK. High mode contamination of multi-drug resistant bacteria in Kolkata: mechanism of gene activation and remedy by heterogenous phyto-antibiotics. Ind J Biotechnol. 2015;14:149-59. Compain F, et al. Complete nucleotide sequence of two multidrug-resistant IncR plasmids from Klebsiella pneumoniae. Antimicrob Agents Chemother. 2014;58:4207-4210. Ito T, et al. Staphylococcal Cassette Chromosome mec (SCCmec) analysis of MRSA. Methods Mol Biol. 2014;1085:131-148. Hasani A, et al. Frequency of aminoglycoside-modifying enzymes and ArmA among different sequence groups of Acinetobacter baumannii in Iran. Microb Drug Resist. 2016;22:347-353. Perumal N, et al. Distribution of genes encoding aminoglycoside-modifying enzymes among clinical isolates of methicillin-resistant staphylococci. Indian J Med Microbiol. 2016;34:350-352. Niu H, et al. The prevalence of aminoglycoside-modifying enzyme and virulence genes among enterococci with high-level aminoglycoside resistance in Inner Mongolia, China. Braz J Microbiol. 2016;47:691-696. Zhao S, et al. Novel gentamicin resistance genes in Campylobacter isolated from humans and retail meats in the USA. J Antimicrob Chemother. 2015;70:1314-1321.